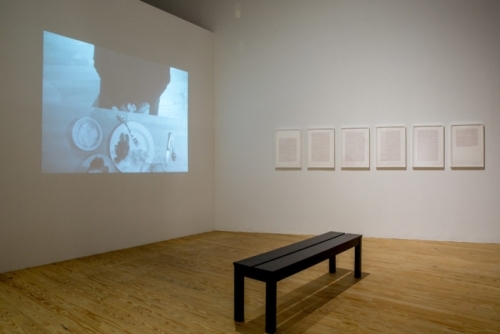 Luis Camnitzer and Coco Fusco included in the group exhibition Walls Turned Sideways: Artists Confront the Justice System curated by Risa Puleo at the Contemporary Arts Museum Houston, Houston, Texas. Walls Turned Sideways features work by artists from across the nation that addresses the criminal justice system, mass incarceration, and the prison-industrial complex. Representing the full range of contemporary art production made in the studio and the social realm, the exhibition includes artworks that take social justice issues as a subject matter; and position the prison and court systems as structures for dismantling through institutional critique. The artworks in the exhibition are extraordinary for the scale and ambition by which they mobilize in order to bring visibility to offenses within the justice system. Walls Turned Sideways recognizes the artist as a figure capable of changing society and poses the questions: What is the social role and responsibility of the artist in times of political urgency? What functions can only art and artists fulfill in the social and political landscape? Moreover, the exhibition considers the relationship between the museum and the prison, focusing on their shared history of collection. Walls Turned Sideways asks if the museum is the repository for all that society values, how is the prison the repository for all society seeks to disown? The justice system in the United States is complex; as a result, artists tend to tackle one component at a time. Walls Turned Sideways utilizes the work of artists to construct a dynamic and nuanced portrait of the prison-industrial complex in the United States according to how people move through the criminal justice system. The conditions of being profiled as a criminal makes one more susceptible to arrest. Once arrested, one moves through a set of procedures related to due process, including the courtroom and trial, and onwards toward incarceration. After incarceration, there are three potential ways one can exit the physical structure of the prison: a life sentence that guarantees death inside the institution, the death penalty, or the possibility of reentry into society. The title of the exhibition Walls Turned Sideways comes from a quote by political activist, academic, and author, Angela Davis: “Walls turned sideways are bridges.” The exhibition hopes to serve as a bridge or connecting conduit for conversation, contemplation, and change.